Holy Moly! I was having a crap-tastic day yesterday…until I read through my emails and found out that I won a blog award. 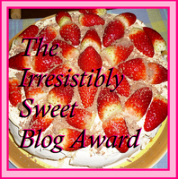 Yes, the wonderful Ms. Lulu at Crafting with Lu gave me an Irresistiably Sweet Blog Award. Thank you for being sweet, Lu! If you haven’t checked out her blog yet, you really should. She is the bomb dot com with her Cricut, and she has REALLY cute “fur babies”! 1. I am terrified of lizards and frogs. I will stop in my tracks if I see either creature, and if a lizard ever got into my apartment…it could have it and everything I own. 2. I talk in circles and it drives The Boy crazy. My stories always have an ending, but there’s a lot of meat in between those sandwiches. 3. I like to make up words and sayings. They may not always make sense to other people, but it amuses me. 4. Mike’s been trying to teach me how to play the guitar off and on for years, but life gets in the way of practicing. We have found that even though I’m right handed, using my right-handed guitar is a challenge. I have to flip the guitar over and play it upside-down. Weird. 6. I like to try weird food combinations. At the last SC state fair, I tried a Krispy Kreme burger…yum! 7. I’m actually jealous of Adam Richman of “Man vs Food”. I love that show and would trade jobs with him in a heartbeat. There are eight wonderful bloggers that I am passing the award along to. Please be sure to check out their blogs. These ladies are funny and gifted. 2. Dallas at Sew Indy– Y’all are probably saying, we know all about her. Well, I’m sorry. I just can’t sing this girl’s praises enough. 3. Virginia at Geeky and Sassy– In my opinion, this lady is all sass! She doesn’t stray from color and has wonderful tips for social media. 4. Julie at Live, Laugh, Love 2 Scrap– I love papercrafts, but I’m very timid with paper. She’s not. Her cards are colorful and fun. 5. Mary at Marys Crafty Scraps– Mary makes me want to purchase a Cricut. She has a warm spirit and she makes paper crafts that leave me saying…”i could buy that”. 6. Lana at My Design, My Life by Lana Koopman– Lana is a graphic designer who will make your heart melt from a cuteness overload. 7. Claire at Polkadot-Pretties– Claire just got a new sewing machine and I’m uber jealous. LOL. She is a self taught sewist (I am too, so I really appreciate that) and is blogging about her new creative adventures. 8. K. The Littlest Crafter- This woman posts some of the most sinfully delicious recipes. She makes magic happen with paper too! But y’all she blogged a chocolate fudge ice cream recipe. Umm hmm! Thank you again to Lu for my first evah blog award! Please check all of these wonderful ladies out if you haven’t already! The winner of the Sew Indy giveaway is…Frances of www.bibeezbaby.com! *Random.org was used to calculate the winning entry. I just don’t know how to post the integer widget, sorry! I'm glad you aren't on Man vs. Food. Love the show, but I wouldn't wanna watch my wife slowly eat herself to death. My first blog award!!! Girl – thank you so much! You have no idea how this just made my whole darn day (and it needed a big pick me up)!! OMG…I love MvF too…Have you watched the new MvF Nation? I am in awe of the people who can eat all that food. I love the interviews afterwards too. Man wins! You are so sweet! Thanks =) What a fun award! You are too kind – and brave! Man v. Food? I couldn't do that in a million years! I am 100% with you on that lizard business. One DID get into my first apartment right after I got out of college. The carpet cleaners left the door open and that's how I suspect he got in. Girl, he was looking at me and I was looking at him as if to say – which one of us is leaving first? He left without much of a fight, thank goodness! All I had to do was open the door. Lol! Thank you so much for thinking of me for this award!!! !